For example, if your first name is Thomas then you could have the address Tommy@Bostock.net or if that's taken, use your middle initial such as TomD@Bostock.net. Our server will instantly forward all received email to your existing email address. If you wish to reserve an email name or check if yours is still available, please send your request using this form. Names will be allocated on a first come first served basis. 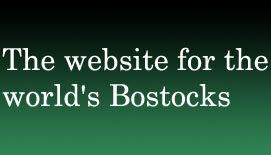 We are also happy to host FOR FREE anything relevant to the world's Bostocks. We will provide a link from the home page on our links page to your page. You can have your own FTP account on our server so you have control of setting up and uploading web pages and data. We support Active Server Pages, Perl, and Access databases. Want to add a link to our links page? Email the URL and a description us using this form.